At Techknowl.com we make it easy for you to find useful software for your Windows, Mac or Linux computers. We also provide tips on Blogger, Wordpress, social media services, SEO and useful Web apps. Paypal has became a widely accepted payment system for online purchase and fund transfer. The advantage of Paypal is the security it provides. It helps users with debit or credit card to purchase online by using email IDs, without exposing their real card number to the merchant. However, Paypal posses few limitations if its not verified using a credit card. Paypal forces all users to verify their account with a real credit card or debit card to enhance the security of the overall process. But getting a credit is still a difficult task in countries like India, although the wishers are in a credit limit to get one. The transfer and withdrawal limitations of unverified Paypal accounts can be removed by using virtual credit cards or VCCs. In India we have many private and public sector banks offering internet banking and virtual credit card service. 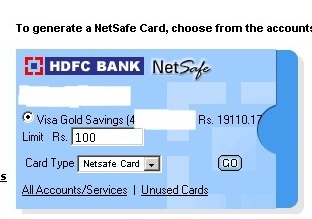 HDFC is one such bank that provides facility called Netsafe, free for all their customers. Verifying Paypal without a real credit card is not recommend. But the HDFC Netsafe card would help users in a very needy situation. In this post we will show how you can Verify PayPal without credit card in India by creating a HDFC netsafe card. HDFC Netsafe card is nothing but a temporary credit card of predefined sum created using HDFC debit card. HDFC provides this facility to their customers in order to enhance their security online. The basic need to verify Paypal is to get a HDFC savings account and one of their international debit card. The minimum deposit for starting a HDFC bank savings account in India is 5000 INR in rural and 10000 INR in urban areas. You have to wait around 4 days for account and debit card activation. Verify Paypal in India using HDFC Netsafe card. Login to the HDFC Netsafe control panel using the link from the bank home page. You have to sign up for using for this service. Enter debit card number and other details to complete Netsafe registration process. After this login to Netsafe service using the username and password created. Paypal deducts USD 1.95 from the target credit card in a usual verification process. This sum will be returned to the Paypal account of the user after verification. So here we have to create a Netsafe card of 100 INR in value. Netsafe service will now generate a virtual credit card from the savings account of the user. Note down the card number, expiry date and security number. Now from the Paypal dashboard, click on the link to get verified. Select Visa from the card options and enter the generated HDFC virtual credit card in the boxes provided. Next step is to get the verification code sent by Paypal from the credit card statement. Login to HDFC Netsafe account and click on all accounts/services> Txn. Details. A list of generated virtual credit cards will be shown as below. Copy the four digit code as shown in the statement. Enter this code in Paypal verification process and complete the process. Paypal return the charged 1.95 USD to the account of the user in 4-5 days. Now you can send and receive unlimited amount of money using Paypal without credit card. HDFC debit cards and Netsafe is currently the most successful method to verify Paypal accounts in India. I have verified my Paypal account few months back. And I am still using the same account to transfer funds received from Chitika and Infolinks to my bank account. You maythen download HDFC mobile app to check the balance in your HDFC savings bank account. The major disadvantage of Paypal verification using HDFC debit card is that it cannot be used with recurring payments. so should i use 600 rs limit where u used 100 or 100 is ok? ?